The bill is paid for through a combination of tax increases and various savings. WASHINGTON (CNN) -- The Senate Finance Committee has crafted a health care reform bill that is less than $1 trillion, Finance Committee Chairman Max Baucus, D-Montana, announced Thursday. The Senate Finance Committee chairman says a health care reform bill has been crafted. Baucus said he will work with Sen. Chuck Grassley, R-Iowa, to pick which policies will make up the bill. They won't release anything until "we get it right," Baucus said. 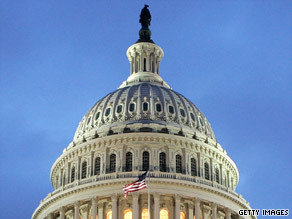 Baucus told CNN that the reform will be funded partly through taxation on benefits. The Congressional Budget Office has also assessed various policy options the committee can choose from in order to meet the politically important $1 trillion price point, Baucus added. A Baucus aide told CNN that the Finance Committee bill would provide insurance coverage for 97 percent of all Americans. Finance Committee members were shocked last week when the Congressional Budget Office determined that their reform bill would cost $1.6 trillion. They have slowly whittled down the amount since. Getting the price tag down to about $1 trillion is key to getting a bill passed, members of the Finance Committee have said. Senators still have to decide which policy options they will choose in order to make up a comprehensive reform package. On Tuesday, Sen. Kent Conrad, D-North Dakota, told reporters that Senate negotiators had cut about $400 billion from the then-$1.6 trillion proposal, still leaving them short of their goal of about $1 trillion. Conrad would not divulge details about the cuts, except to say they are coming from "a wide array of places." He said some of the biggest savings have been made by changing the amount of the subsidies the uninsured would get to help purchase insurance. CNN's Ted Barrett and Dana Bash contributed to this report.